componisten: Manuel María Ponce, Agustín Barrios Mangoré, Federico Mompou. opname: in de Rockaway Studios, Castellón de la Plana, Spain, 14-16 december 2016. Manuel María Ponce Cuéllar (8 December 1882 – 24 April 1948) was a Mexican composer and the founder of Mexican musical nationalism, often incorporating the melodies of harmonized folksongs into his music. Heitor Villa-Lobos, who met Ponce in Paris in the 1920s, wrote: “It gave me great joy to learn that in that distant part of my continent there was another artist who was arming himself with the resources of the folklore of his people in the struggle for the future musical independence of his country.” Widely travelled – he studied in Europe, at first in Bologna and then, between 1925 and 1933, as a pupil of Paul Dukas in Paris – Ponce assimilated a wide range of styles and influences, including European Romanticism, indigenous idioms and a more advanced harmonic language. 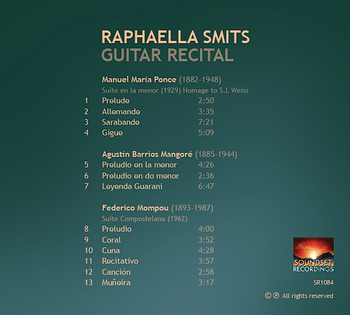 Ponce's guitar music is a core part of the instrument's repertory, and many of these works were dedicated to his long-time friend and guitar virtuoso Andrés Segovia. Agustín Barrios Mangoré (5 May 1885 – 7 August 1944) was a Paraguayan virtuoso classical guitarist and composer, largely regarded as one of the greatest performers and most prolific composers for the guitar. His music (over 300 compositions) remained undiscovered for over three decades after his death. At the age of eighteen, he made his debut at the National theatre in the capital Asuncion, where he mingled with a group of intellectuals and artists. In 1910 he moved to Buenos Aires where he met the famous tango singer Carlos Gardel. There he became one of the first guitarists who made vinyl recordings. While recovering from a serious illness, his first editions were published. 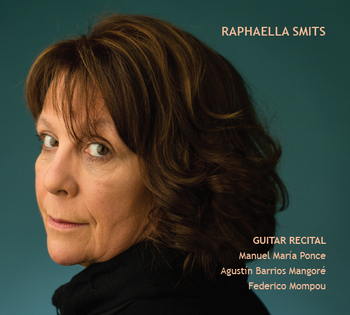 He was called the ‘Paganini of the Guitar’ and praised by Villa-Lobos as unsurpassable. He met several times with maestro Andrés Segovia who expressed his admiration, but who later refused to play his music. At the age of 40, Barrios decided to leave Paraguay for good. Five years later he transformed himself as ‘Chief Nitsuga Mangoré from the jungle of Paraguay’, most likely for marketing reasons. He travelled successfully through French Guyana, Trinidad, Venezuela, Costa Rica, San Salvador and Honduras. Later he visited Mexico, where the Paraguayan ambassador convinced him to drop his unconventional attire and also got him an official diplomatic passport allowing him to travel freely. In September 1934 he came to Belgium, met Igor Stravinsky, and gave a prestigious concert at the Brussels Conservatory, with the royal family present. After almost one year in Germany without performing, he returned to Brussels to play for the high society. Next, he was able to meet Regino Sainz de la Maza and Federico Garcia Lorca. Following his contact with the Spanish royal family, he received a Morant guitar from the Queen as a present. With World War II about to start, Barrios moved back to Venezuela and returned to touring in South America, performing and composing. He died in San Salvador. In execution of his last will, his sketches and latest manuscripts regrettably were burned. Federico Mompou (16 April 1893 – 30 June 1987) was a Catalan pianist. Too shy for a solo career, he devoted his life to composing. The essential objective for Mompou was to acquire “the greatest expressive force with maximum simplicity and economy of means, as well as a return to primitivism in order to present the musical idea naked and pure”. Federico Mompou without a doubt is the most representative composer of Catalan music. Born in the same year as the painter Joan Miró and the great Catalan poet Carles Riba, the name of Mompou is associated with the Catalan renaissance movement that has given rise to such significant figures as Antonio Gaudí, Salvador Dalí and Pablo Casals. However, Mompou refuses to be a folklorist. His principal influences were connected to Francis Poulenc, Erik Satie, Gabriel Fauré, Claude Debussy and Maurice Ravel.